Autographed balls net almost $2K from fans. 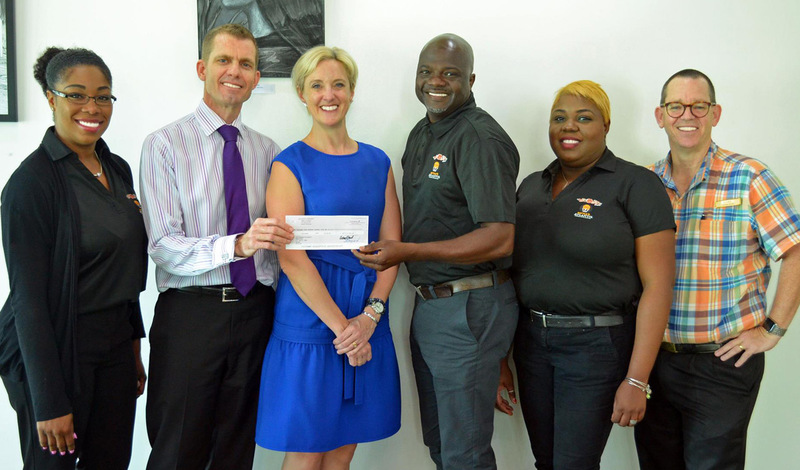 NASSAU February 2018 – Caring fans at the 2017 Bad Boy Mowers Battle 4 Atlantis Basketball Tournament used their love for the game and sense of community to help raise almost $2000.00 for ACE Diabetes here in The Bahamas. Special edition logo balls were signed by all 8 team-coaches and a silent auctioned was held during the 3-day event to raise the funds. Since its inception, the event organizers have looked for ways to use the event as an opportunity to touch the local community in a positive way. According to Bill Coteron, VP & GM of Conference and Banquet Operations, 2017’s tournament was an opportunity to improve the effort made in 2016. President of the Board of Directors for ACE Diabetes Dr. Graham Cates expressed his gratitude to Atlantis for the donation. Explaining the meaning behind ACE (Awareness, Compassion and Education) he stated how the donation will help them continue their work. Quinton Brennen, Executive Director of Special Events and Entertainment added that the team is looking forward to the 2018 event and doing even more. CAPTION: Battle 4 Atlantis team members donate cheque to ACE Diabetes. From L-to-R: Donnarae Rolle; Dr. Graham Cates, President of ACE Diabetes; Anita Cates, VP ACE Diabetes; Quinton Brennen, Executive Director of Special Events and Entertainment, Francelaine Dumercy, Box Office Coordinator and Gary Gilihan, Sr. Director of Stewarding Atlantis.